The Shredder Cheese Grater Looks Like Fun | OhGizmo! For behind the scenes pictures, stories and special contests, follow us on Facebook! By David Ponce on 10/30/12 • Leave a comment! If you’re going to be playing the air guitar, why not be a little productive in the process? 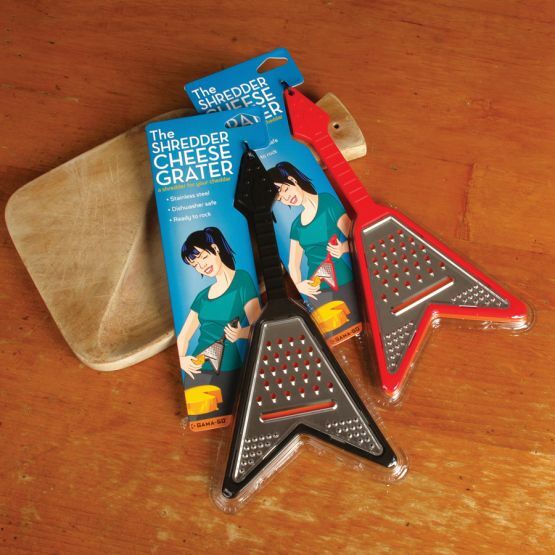 The Shredder Cheese Grater looks like a Flying-V but features a stainless steel grater. It’s quirky and fun. And it’ll likely make a mess of your entire kitchen if you use it the way we imagine someone would. We don’t care. OhGizmo! is a frequently updated blog that focuses on covering items that will appeal to a very specific and often very passionate audience: the geek. Aside from the fare of innovative consumer electronic products, the reader can expect to find news about geek culture, absurd inventions, awe inspiring technology, and an ever growing assortment of articles that we like to think fit within our view of what we’re calling the Geek Lifestyle. OhGizmo occasionally works with advertisers to monetize some of the pages on this website. That means that some, not all of the links on our pages earn us a small commission when you make a purchase after reading our in-depth content. However, OhGizmo’s content will always remain independent regardless of advertiser money or incentives, allowing you to purchase products with confidence, knowing they’ve been evaluated with complete objectivity.